Saint Augustine wrote this document to provide a guide for his community of priests. It is remarkably simple, reasonable and evangelical. Because of that, many orders, male and female, have used it as their rule. 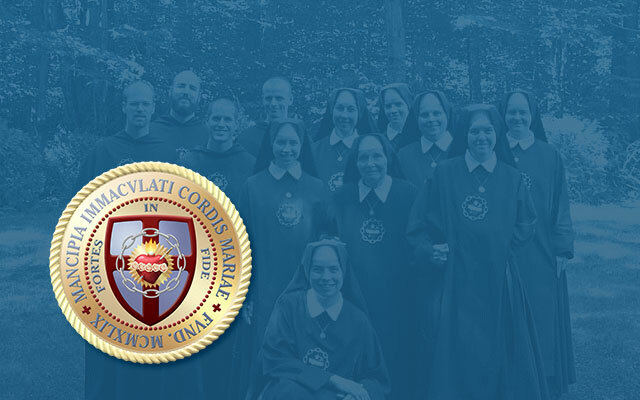 1 This Holy Rule, together with our Constitutions, form the Fundamental Code of religious life for the Slaves of the Immaculate Heart of Mary. First, that you dwell together in unity in the house and be of one mind and one heart in God, remembering that this is the end for which you are collected here. Call not anything your own, but let all things be held in common among you. Those among you who in the world possessed any goods should be heartily willing that in the monastery they should become the common property of all. And those who before possessed nothing should not in the monastery seek those things which in the world they could not have had. If, however, they are in weak health, everything needful should be given to them, even though their poverty in the world was so extreme that they were without the mere necessities of life. Yet they must not make their happiness consist only in the fact of being supplied with food and clothing such as they could not provide for themselves in the world. Nor should they be puffed up because they are in the company of those to whom in the world they would not have ventured to approach. Let them rather lift up their hearts to heaven and not seek after earthly vanities lest it should come to pass that monasteries should be useful to those only who formerly were rich, as would be the case if the rich were to be humbled in them, and the poor allowed to become puffed up with pride. Again, those on the other and, who held a certain position in the world must beware of despising those among their brethren who may have come from a poor state to this holy brotherhood. They should endeavor to glory in the companionship of their poor brethren and not in the rank of their rich parents. Nor ought they vainly to exult if they have contributed anything out of their abundance to the support of the community, thus taking heed not to be more proud of their riches because they have been divided in the monastery than they were when they enjoyed them in the world. For this is the peculiar feature of pride, that whereas every other kind of wickedness is exercised in the accomplishment of bad deeds, pride creeps stealthily in and destroys even good deeds. And what does it profit a man to give all his goods in alms to the poor and become poor himself, if his wretched soul becomes more proud by despising riches than by possessing them? Let all then live together with one mind and heart, and in each other honor God whose temples you are. Be constant in prayer at the appointed hours and times. In the oratory let no one do anything except the one thing for which it is made and from which its name is derived so that if anyone should wish, besides the appointed hours, to spend any of his leisure time in prayer, no hindrance may arise from those who may be doing other things there. When you pray to God in psalms and hymns, entertain your heart with what your lips are reciting, and chant only those things appointed to be chanted; but what is not written to be sung, sing not. Tame your flesh with fast and abstinence from food and drink so far as your health will allow. But in case anyone is unable to fast, he must not take any food out of meal times unless he be sick. At table listen quietly and in silence to that which according to custom is read to you until you rise from the meal so that not only your bodies may be refreshed with food, but your minds also may be strengthened with the word of God. If some who are weak from former habits are differently treated in matters of meat and drink, this must not breed any feeling of discontent nor be considered unjust to those whom habit has made stronger. Nor should they consider those the more highly favored who take what they themselves abstain from; rather they should rejoice that their strength permits them to do what others cannot. And if certain articles of food, raiment, or clothing are given to those who have been accustomed in the world to a more delicate kind of life while they are not given to the stronger, and therefore happier, members of the community, those ought to recollect that, although their companions cannot practice the same abstinence, still there is a great difference between their present life and that which they were accustomed to lead in the world. Nor ought all to desire to have the particular things they see given to a few, not in order to do them honor, but out of compassion to their weakness; lest by an abominable perversion it should come to pass that in the monastery where those who once were rich learn as far as possible to lead a hard life, those who were poor should grow luxurious. Let the sick whose weak condition during illness obliges them to take less food be treated when their sickness is past in the way that will enable them most quickly to regain their strength even if they were formerly in the very lowest state of poverty; for then their recent illness gives them the same claim to lenient treatment as the habit of their former life gives to those who once were rich. But when their strength is restored let them return to that happier rule of abstinence which the servants of God ought to observe with greater strictness as their needs grow less; for they must not continue for mere gratification of the appetite what was begun for the requirements of health. Those who are the best able to abstain should be considered the most fortunate since it is better to need little than to have much. Avoid singularity in dress, and strive to please others by your conduct and not by your clothes. Whenever you go out, walk together; when you reach the place where you are going, remain together. Let there be nothing to offend the eyes of anyone, whether in your gait, your posture, your dress, or your movements, but let everything about you be in keeping with the holiness of your state. Although your eyes may perhaps fall on a woman, they must never be fixed on her. For in passing here and there, you are not forbidden to see women, but to desire them or wish to be desired by them is wicked. On either side bad passions are stirred up, and that not merely by touch or by thought, but by sight alone. And say not that your minds are pure if your eyes are not kept in modest restraint, for the immodest eye is the messenger of the impure heart. And when such hearts exchange thoughts by looks though without words and by fleshly concupiscence allure each other with evil desires, then chastity flies from the soul, even though the body is free from outward stain. And when a man fixes his eye on a woman, or takes pleasure in being looked on by her, let him not imagine that his sin will pass unnoticed. He will surely be seen and by those he thinks not of. But even if he were hidden from all human sight, how can he avoid that which is above, from which nought can be hid? Shall we imagine that God does not perceive because His wisdom enables Him to show such patience? A holy man, then must fear to displease Him, and so keep himself from wishing sinfully to please a woman. Let him remember that God sees all and so avoid all sights that are sinful. For in this very matter the fear of God is commended to us by these words: “He who fixes the eye is an abomination to the Lord.” Where, therefore, you are together in church, or in any other place where women are, be a guard one to the other in the matter of chastity and in this way will God, who dwells among you, preserve you by means of one another. If you should detect this wantonness of the eye of which have been speaking in any member of your brotherhood, forthwith admonish him that the evil thus begun may not grow worse but may be corrected by your charity. But if, after this warning, the same fault is perceived in him on that or another day, the fact must be disclosed as a wound that needs cure. Beforehand, however, let it be brought under the notice of one other, or at most of a third person, in order that the culprit may be convicted by the mouth of two or three witnesses and may be corrected with due severity. Nor are you to consider that you are acting in an uncharitable manner when you thus point out your neighbors’ faults. Or the contrary, you cannot be free from blame if by your silence you allow your brethren to perish, when by pointing out their faults you might have corrected them. For if your brother had some bodily wound which he wished to hide through fear of the surgeon s knife, would it not be cruel to keep silence and merciful to reveal the wound? How more, then, are we bound to reveal that which will cause a worse corruption in the heart! But, first of all, before bringing it to the notice of others who are to convict him on his denial, it should be put before the superior in case he has neglected to amend after having once been warned in order that if possible, his fault may be corrected privately and may not need to be made known to the rest of the community. Then, if he should still deny the charge he must be confronted publicly with the other witnesses so as to be convicted not by one mouth alone, but by many. And when his guilt has thus been proved he must submit to such punishment as the superior, whose office it is to inflict penalties, may think fit to impose. Should he refuse to perform his penance, and has not departed of his own accord, he must be cast out of your society. Nor is such treatment cruel, but merciful, for many must not be suffered to perish by the pestilent example of one. And what has been said here with respect to the custody of the eyes should also be faithfully observed in all cases where faults are discovered, forbidden, denounced, proved, or judged. Yet remember to let love of the sinner be ever united to hatred of his sin. But if anyone shall have gone so far in evil as to have secretly accepted letters or presents and of his own accord confess having done so let him in that case be forgiven and prayed for. If, however, the fault be discovered, and he be convicted, then must he be very severely punished at the will of the superiors. Your garments should be kept together under the care of one or two, or as many as are required to see that they are kept free from moths so that even as we are fed out of one larder, we may also be clothed out of one wardrobe. Try not to concern yourselves about being provided with clothes exactly suited to the changes of the season, still less about whether you receive the same which you had before or those which another had. Let everyone, however, be supplied with that which is necessary, And if any disputes or murmurs should arise among you upon this matter and one should complain that something not so good as he had before has now been given him and should think himself slighted in being made to wear the clothes formerly worn by another brother, reflect that much must be wanting in that inner garment of sanctity which should clothe the heart, when you contend about the mere raiment of the body. If you are allowed, however, out of condescension to your weakness to have the clothes you wore before, still they must be kept in one place and under the care of the officials so that no one may act in a selfish spirit but that all things may be done with a greater care and more thorough cheerfulness than if each one were working for his own selfish interests. For when we find it written of charity, that she “seeks not her own,” we should thus interpret the words, namely, that the common good is to be preferred to our own selfish interests, and not our own interests to the common good. Judge, therefore, your progress by this rule whether or not you more and more prefer the welfare of the community to your own private interests, so that in all the needs of this life which pass away that charity may reign which abides forever. It follows then, that when any secular person shall give either clothes or anything else considered to be necessary to a member of the community even though it be to his own son or to one to whom he feels especially bound by some other tie, the gift must not be secretly received, but must be placed in the hands of the superior so that it may become the property of the community and may be given to him who needs it. But if anyone should conceal a thing given to him, he must be judged guilty of theft. Let your clothes be washed either by yourselves or others according to the arrangement of the superior in order to prevent your souls from contracting any stain through excessive niceness about the cleanliness of your garments. The medicinal bath should by no means be denied when illness makes it necessary. It should be taken without any murmuring according to the advice of a doctor, so that even if it is not wanted, that may be done under obedience which health requires. If, however, it be desired at a time when it is not expedient, permission to use it must not be granted, for we are often inclined to consider those things to be good for us which give us pleasure while in reality they are not so. If a servant of God complains of some hidden ailment, he should be believed without doubt. Still, if there is any uncertainty about whether the particular remedy he desires is the best for him, a doctor must be consulted on the matter. Go not to the baths or any other place in less number than two or three together. And he who has need to go anywhere must go with the companion appointed by the superior. The care of the sick, whether those recovering from illness, or those suffering from any ailment — even without fever — should be committed to one person who should obtain from the storekeeper whatever he judges necessary in each case. Those who have charge of the storeroom, wardrobe, or books should willingly place themselves at the service of their brethren. Books should be applied for at an appointed hour each day, out of which time none should obtain them. Those who have the care of the clothes and shoes must not delay to give that which is needful to those who ask. Have no disputes, but if any should arise, bring them to a speedy end, lest anger should grow into hatred, the mote into the beam, and should give you the soul of a murderer. For thus you read “He who hates his brother is a murderer.” If anyone has injured another by reproachful or railing words or by false accusation, let him remember to apologize as quickly as possible, in order to heal the wound he has inflicted — and the injured one must forgive without delay. And if the inquiry has been mutual, forgiveness must be mutual also and all the more on account of the many prayers you say, for the more frequent are your prayers, the more holy they ought to be. He who is more frequently tempted to anger, but is quick to beg pardon of him whom he has offended, is in a better state of soul than another who is slower in becoming angry, but slower also to beg pardon. But he who will never ask pardon, or at least not from his heart, has no business in a monastery even should he not be expelled from it. Keep yourselves, therefore, from harsh words. But if you should have uttered them, be not slow to remedy the injury by the same mouth that inflicted it. Superiors, however, are not bound to ask pardon of their subjects even though they may feel conscious of having used harsher words in correcting them than the necessities of discipline required, lest by an indiscreet exercise of humility the authority of the superior should be weakened. Still, he should ask pardon of the Lord of all who knows how tenderly you love those whom you have rebuked, perhaps too severely Your affection one for the other must not be carnal, but spiritual. Obey as a father your local superior and still more carefully your higher superior who has charge of you all. To insure the observance of all these things, and so that any irregularities be not negligently connived at but carefully corrected, it will be the special duty of your superior when he finds anything that exceeds the limits of his power or of his jurisdiction to control, to refer the matter to him who holds the supreme authority over you. Your superior should not take pleasure in ruling you but rather in serving you with all charity. While the honor you pay him exalts him in your eyes, let fear prostrate him at your feet before God. He should give an example of good works to all . Let him correct the unruly, encourage the fainthearted, comfort the sick, be patient with all. Let him observe the rule with cheerfulness himself and cause others to observe it by the reverence he inspires. And though both are necessary, still it should rather be his desire to be loved than feared by you, ever mindful of the account he will have to give to God of your souls. For this reason also you, by a thorough obedience, show mercy not only to yourselves, but to him who, being in the higher position among you, is therefore in greater danger. May the Lord grant that as lovers of the beauty of the spiritual life and breathing forth the sweet odor of Christ in the holiness of your ways you may faithfully observe these things, not like slaves under the law, but like freemen established under grace. Let this rule be read to you once every week so that in it you can see yourselves reflected as in a mirror lest anything be forgotten and, therefore, neglected. And when you find that you are doing what is here written, thank the Lord, the giver of all good things. But if, on the contrary, anyone perceives that he has fallen into defects, let him mourn over the past, take heed for the future, pray that his faults may be forgiven, and that he may not be led into temptation. Buy the audiobook of this Rule in CD or MP3.